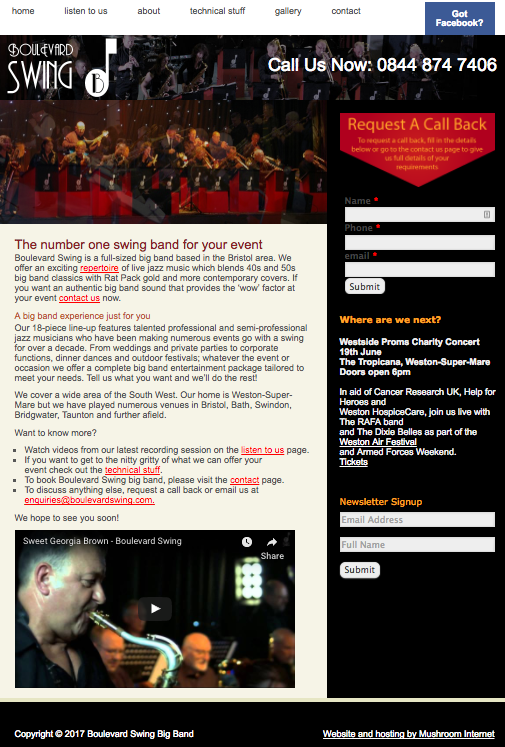 Formed over a decade ago, Boulevard Swing has evolved into one of the finest 18-piece big bands in the South West. Boulevard Swing’s line-up comprises a mixture of professional and semi-professional musicians, boasting five saxophones, four trumpets, four trombones, piano, bass, rhythm guitar, drums and our excellent resident vocalists. We were looking to revamp our band website as our old one was very static, outdated and messy! Whilst we had an idea of the content we wanted, Mushroom came up with great creative ideas and designs to make it come to life, adding little touches to make it more user-friendly for our followers and potential new bookings. The site is also easy for us to update with our new activities. The design team were friendly, really helpful and quick to respond to our requirements. Overall, the band are delighted with the new website, which not only exceeded our expectations but reflects the professional and personal service we want to offer our clients.